Nanaimo-Info-blog: Can You Identify This Happy Fellow? 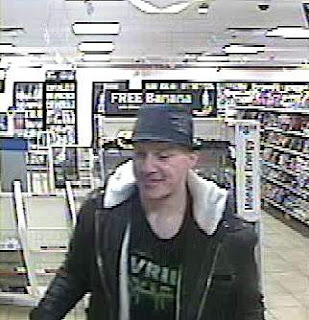 The Nanaimo RCMP is asking for the public's assistance in identifying a male suspected of committing various frauds with a credit card stolen during a Break and Enter. The original break in was reported at approximately 8 am on March 15, and occurred at a home in the 600 block of Nicol St. Several hours later, the male shown in the attached video surveillance photo, allegedly used a credit card taken during the Break and Enter to purchase items at various downtown businesses. The suspect male is white, 30-35 years old with short cropped hair, wearing a dark coloured fedora and from video surveillance, appears to be enjoying himself. If you have information on who this person may be, call the Nanaimo RCMP at 250-754-2345. If you wish to remain anonymous contact Crime Stoppers at www.nanaimocrimestoppers , text 274637, keyword Nanaimo or call 1-800-222-8477.